Becky:Hi everyone! Welcome to JapanesePod101.com! This is Japanese for Everyday Life Lower Intermediate, Lesson 1- Making Substitutions at a Japanese Sushi Restaurant. I'm Becky. Kaori:こんにちは！古橋 香織です！Hi everyone, Kaori Furuhashi here! Becky:Right, this series is a little different from the typical JapanesePod101.com lesson type. Becky:Those lessons focus on grammar, but this series places the focus on everyday tasks with specific objectives. In this lesson, you will learn a useful skill for ordering at a restaurant: How to get a waiter or chef to replace one item with another. Becky:Yes, I do. I like sushi a lot. Becky:Actually, I can't eat sea urchin (J:ウニ). Well, I should say, I don't really like it because technically I'm able to eat it. But it's always in the sushi sets I order. Becky:So, I can say “can you replace the sea urchin with something else?” That's a very useful expression! Becky:Listen to the dialogue and participate when prompted by speaking aloud in Japanese. Use the patterns of Japanese you studied in the Beginner-level lessons. After you speak, you'll hear a model line of dialogue. Your answer does not need to be exactly the same, but do compare your response to the model line. 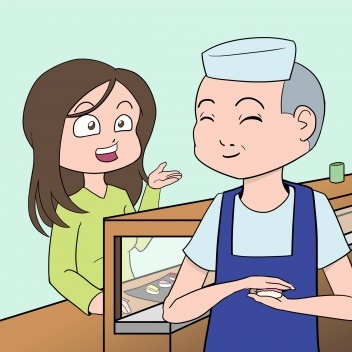 In this lesson, you will play the role of a customer at a sushi restaurant, where the chefs, called itamae, stand behind a counter across from the customers. Your goal is to get the chef to replace a certain item you can’t eat with something else. Becky:meaning “some other sushi item”. This is what the chef would say. Becky:Yes, it's pretty cool if you know to use this term. Becky:Here are some other kinds of sushi. Becky:Now, this task requires a few key expressions. First, the question, "Is sea urchin included in the set?" Becky:In Japanese, "to be included" in something might more literally be translated as "to be inside" something. Becky:Here's the word for "replace." something else. Here's the expression. Becky:Now, imagine you want to replace sea urchin with tuna (Kaori:マグロ). To request this, just remove the phrase for "something else" (Kaori:他のもの) and replace it with the word for “tuna” (Kaori:マグロ). Say the sentence pattern, using the word for “tuna”. Becky:Next, imagine you want to replace sea urchin with squid (Kaori:イカ). Use the sentence pattern with the word for “squid”. Becky:Finally, instead of replacing “sea urchin” with "something else," use the professional term for "some other sushi item." (Kaori:他のネタ). Use the sentence pattern from before. Becky:What if you don’t remember the verb, “replace (Kaori:取り替える）”? Becky:Furuhashi-sensei, could you tell us a bit more about the pattern here? Becky:Here also — use the the potential form of the verb (Kaori:変える) which is (Kaori:変えられます). Becky:Now, try the dialogue using some alternative words you learned in this lesson. You're a customer at a sushi restaurant and you dislike squid (Kaori:イカ). You want to change it for something else (Kaori:他のネタ). Use as many of the expressions you learned in this lesson as possible. Becky:(T: Now, you are about to order a set. Ask if squid is included in it. Becky:How did you do? There are in fact a large number of variations you can use in this situation. Make sure to look for them in the lesson notes. Becky:Okay, That’s all for this lesson. Becky:Is there anything you can't eat? Please use the phrases you studied in this lesson to get a chef or a waiter to replace it! Becky:In the next lesson, you’ll learn how to request a seating change at a restaurant. Becky:See you all next time! Which sushi item do you like the best? In Japan, vegetable sushi is getting popular these days. わたしはいくらが好きです? I like sushi with salmon fish eggs.